In this informative and action-packed one-day self defense class you will learn to deploy and use your folding knife with great skill. The Spyderco Clip-It or similarly styled pocketknife is a superb stand-alone self defense tool and an excellent companion to firearms, pepper spray, and other defensive tools in your family's layered personal protection plan. Most small pocketknives can be carried in any State and in most foreign countries. If you can't have your handgun, have your knife! Students will use special training knives to "cut" their way out of mock assaults. This course also integrates defensive knife skills with your defensive handgun skills, so wear your carry gear (inert guns will be provided, bring your own if you have one). This self defense class is highly recommended for women and teenagers, who are the most likely group to encounter grabs, chokes, and holds with the greatest disparity of force during violent assaults. 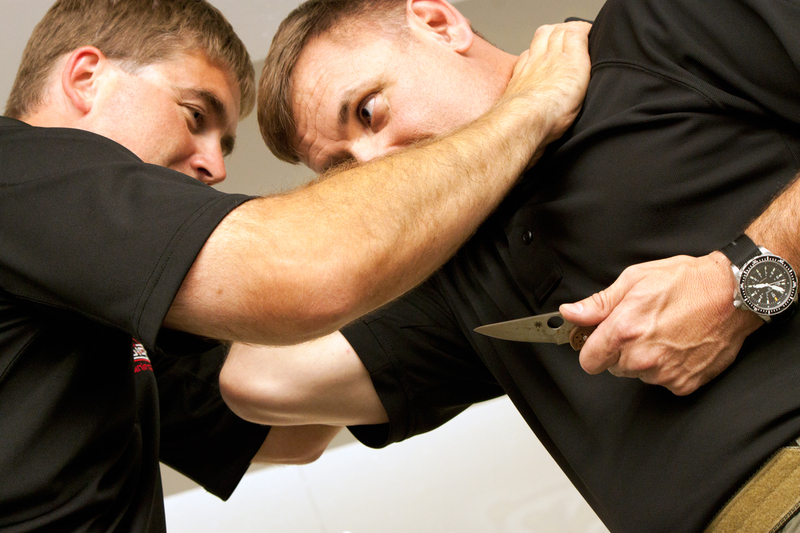 One day of self defense knife training will allow you to be victorious over an opponent with years of street fighting, martial arts, or wrestling training! Lightweight, comfortable clothing with long sleeves and long pants (with pockets! ); Court shoes, wrestling shoes, or no shoes. You will be working in close contact with other students, so good grooming is appreciated.